And here it is! 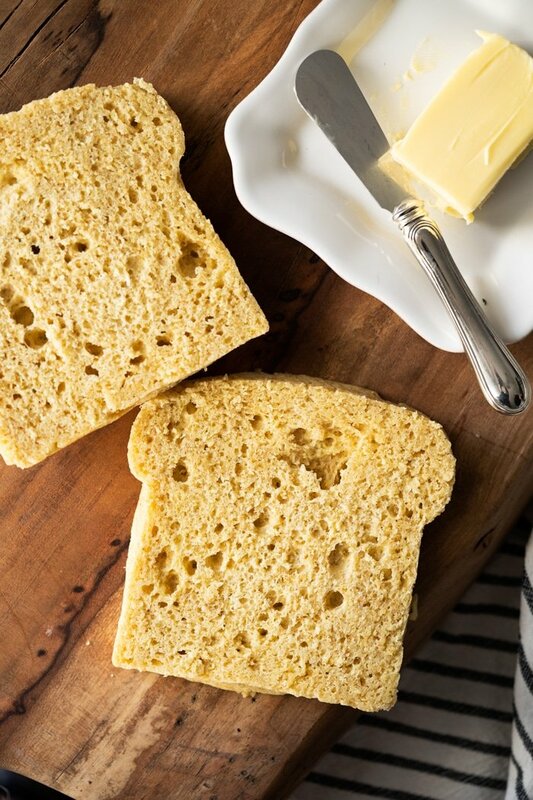 A 90 second keto bread that’s not eggy (at all!) and toasts great. Expect a lovely lightly sweet bread that’s ridiculously easy to whip up! Not Eggy & Toasts Great! One of the most requested recipes by you guys has been for a 90 second keto bread… but y’all clearly begged for it not to come out tasting like an omelette! And so here it is, a lovely cross between a cornbread and a Hawaiian sweet roll. Sounds weird? Yeah I thought so too! Ok let me explain. When at room temperature I’m fairly certain you’ll all agree it tastes like a lovely corn (free) bread. Dense, but soft and lightly crumbly (and I’m fairly certain that with a cornbread extract some good stuff will happen). But then when you warm it up, it goes softer again and reminds me of a lovely sweet bun. Funny business with these mug breads (and cakes). Remember the chocolate mug cake? Came out fluffier than the actual oven-baked cake! Either way it toasts nicely, and in the end this is non negotiable. That is the thing with microwave breads: they come out looking like fugly little white sponges (see pic below!). And (perhaps obviously?) don’t expect it to come out as great as oven baked bread, but still good and yummy. So if you’re looking for a ‘proper bread’ do check out our soft ‘n fluffy sandwich bread (with yeast!). Each batch makes 3 servings, and you can either cook it up all together (as I did, using a mold such as this)… or you can divide it in three and use some small ramekins. If you divide the dough in 3 you’ll cook the bread for 90 seconds on high, but if you cook it all together you’ll want to do 150 seconds (2 1/2 minutes). Either way, it’ll come out looking pale and spongy (and not very appetizing at all tbh!). But worry not, just wait for it to cool down until just lightly warm (it continues to cook guys! 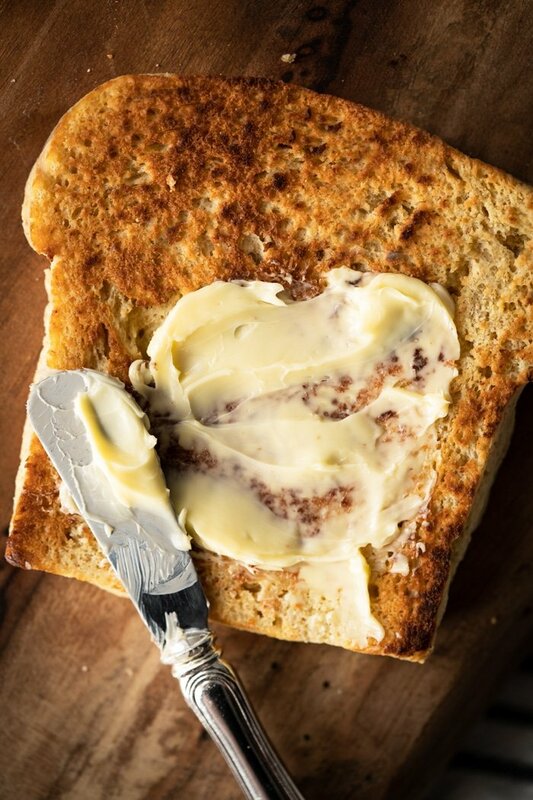 ), and then you’ll definitely want to give it a toast to get some texture on. Yeah definitely! But if you’re going to get into that territory, I’m just going to suggest you whip up our keto cornbread instead. That one was specifically designed for the oven, and they’re very similar (plus you’ll have leftovers to freeze or whatever suits your fancy!). OK, so (per standard gnom-gnom practice!) this recipe uses a mix of grain free flours, so I do suggest that if it’s a recipe you’re making often to simply make a mix. Say, multiply all the ingredients by 5 or 10 and then you can simply scoop out the amount you need and mix it with the eggs and butter. 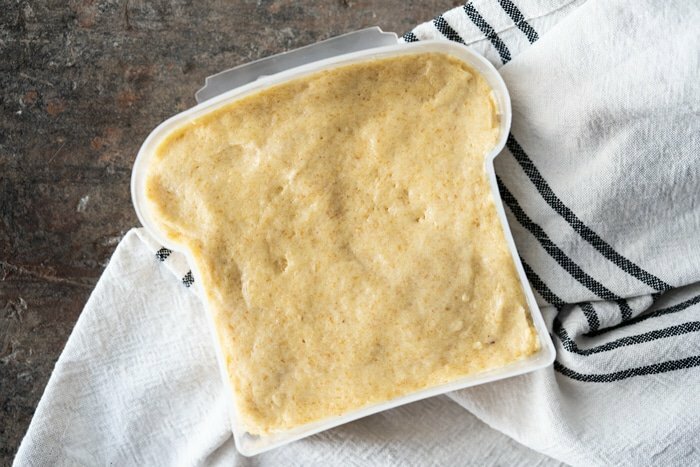 This 90 second keto bread uses a mix of super fine almond flour, golden flaxseed meal, whey protein isolate, and a touch of xanthan gum. Just keep in mind that for best texture and rise, you’ll always want to regrind your golden flaxseed meal in a dry blender or bullet. Oh, and golden flaxseed isn’t the same as normal flaxseed (which results in gummy and dense baked goods). Whey protein isolate. This one is pretty much a must if you’re baking the bread in a pan (say as opposed to muffins), as it will ensure your bread doesn’t collapse post-bake. Having said that, you can sub it with more almond flour and bake it in a muffin pan (smaller baked goods have don’t require as much structure). Not exactly the same, but works well. Keep in mind that this ingredient varies tremendously from brand to brand. I generally used Isopure’s Zero Carb Unflavored, but have been experimenting with this grass-fed brand and it works just as well. This keto microwave bread does have a touch of sweetener, but you do have some leniency on its sweetness. Say, you can use only 2 teaspoons for a light hint or up to 5 for a sweeter take. Either way, I highly suggest you don’t skip it as it brings out the natural sweetness of the keto flours, and defines the taste of the bread. You’ve got a few options here. Erythritol (Lakanto is awesome here), Xylitol (non-corn though to avoid tummy troubles!) and allulose are my top choices (no aftertaste at all!). Pyure is also a good one for muffins and quick breads, particularly if you’re trying to limit your sugar alcohol consumption (it’s added stevia makes it twice as sweet as sugar… i.e. you add half!). And here it is! 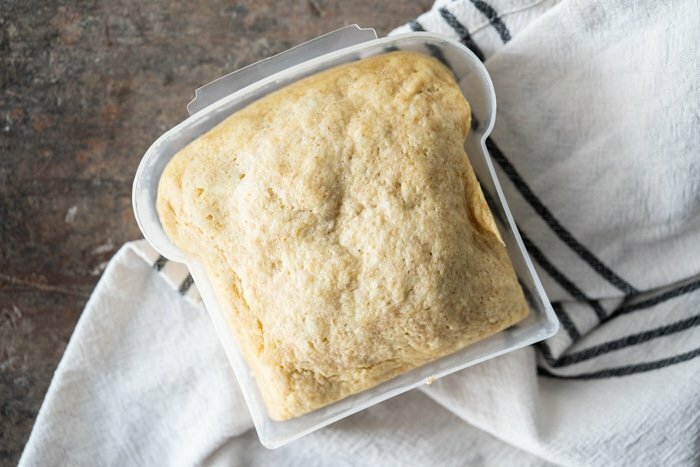 A 90 second keto bread that's not eggy (at all!) and toasts great. 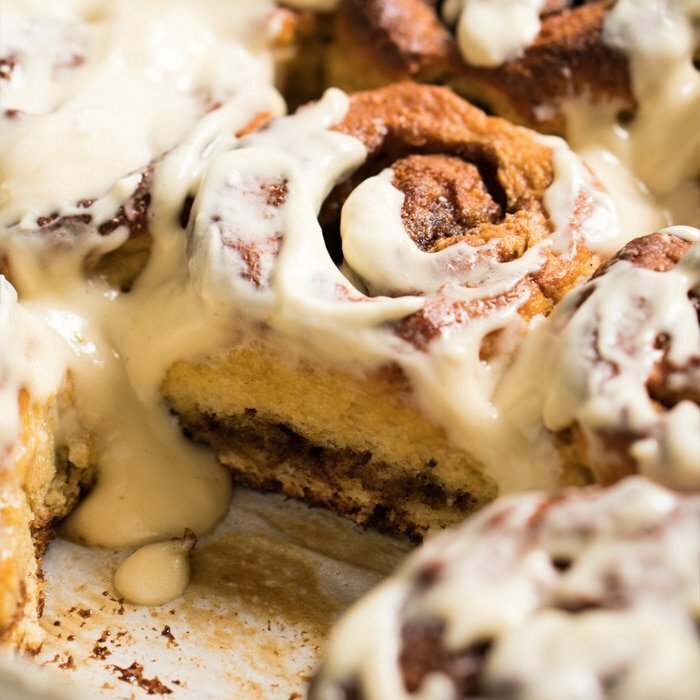 Expect a lovely lightly sweet bread that's ridiculously easy to whip up! Add almond flour, flaxseed meal, whey protein, baking powder, xanthan gum and salt to a medium bowl. Whisk until thoroughly combined, set aside. Note: feel free to make the flour mix ahead in a large batch and simply measure out 80g (or 1/2 cup + 6 TBSP) per bread. Add egg and sweetener to a large bowl and beat with a whisk or electric mixer for 1 minute or two until airy and lighter in color. With the mixer on, add in the apple cider vinegar and butter. Add in the dry flour mixture in two parts, alternating with the sour cream. Continue to mix for a minute until fully incorporated and elastic, the batter will thicken as you mix (think almost a cookie dough texture!). 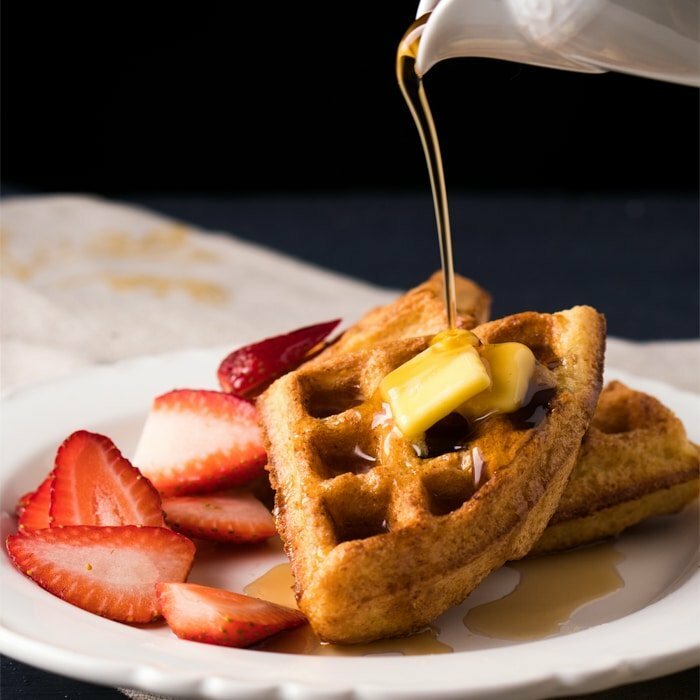 Transfer the batter to a microwave-safe dish or mold (use either a large one or divide into 3 ramekins), pressing down and smoothing out the top with a wet fingertips. If you divide the dough in 3 you'll cook the bread for 90 seconds on high, but if you cook it all together you'll want to do 150 seconds (2 1/2 minutes). Time can vary a lot in microwaves, but to give you an idea mine is 1000 watts. Either way, it'll come out looking pale and spongy (and not very appetizing at all tbh!). But worry not, just wait for it to cool down until just lightly warm (it continues to cook as it cools guys!). Then you'll definitely want to give it a good toast to get some texture on (non negotiable guys!). Store in an airtight container for 2-3 days or in the freezer for a couple months. Serve warm with a pat of butter (non negotiable in my book!). *How sweet? 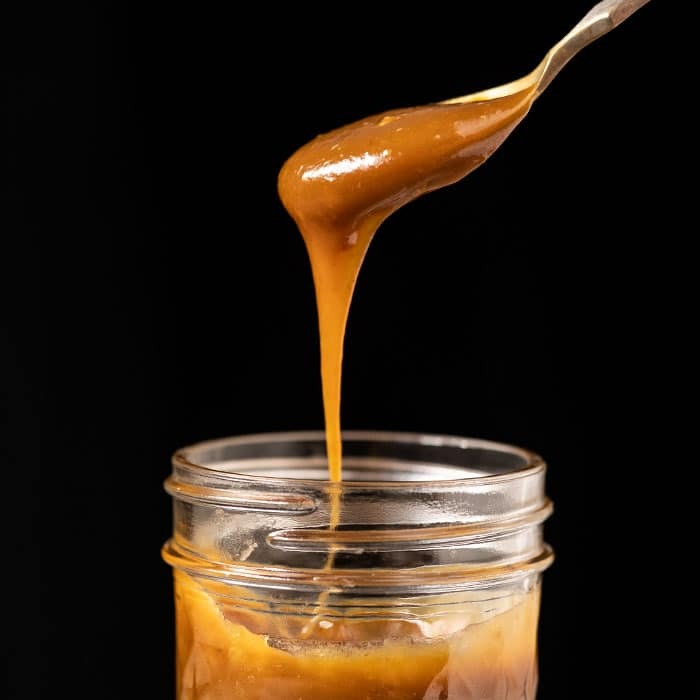 You can use only 2 teaspoons for a light hint or up to 5 for a sweeter take. Either way, I highly suggest you don’t skip it as it brings out the natural sweetness of the keto flours, and defines the taste of the bread. Think a cross between cornbread and Hawaiian sweet rolls! If making cornbread muffins, they'll bake in roughly 25-30 mins. What have you tried David? In all honesty eggs do make Keto Recipes come out better, but I know some readers use flax and chia eggs with relative good success. xo! This was delicious, like others stated I’ve tried several other 90 second bread, but this was the best. Will be my go to for toast, hamburger buns, and grilled cheese sandwiches. Could you advice a substitute for whey protein in this recipe please ? I’ve been making it with pea protein powder and it seems to be fine…although I haven’t tried with whey protein yet so not sure how much difference it makes. I have never commented on a recipe post ever. But i’ve tried so many mug breads and honestly Paola, this is the best hands down. It tasted lovely with a pleasing texture, more biscuit/scone like, which i am not complaining about. I used vanilla whey protein (which was sweetened) omitted the sweetener and used heavy cream in place of sour cream. Such a treat. Will be making again and again for sure. Well now I’m honored Adeline! Thank you for taking the time to write back, so wonderful to hear you enjoyed it so much! xo! I bought the mold to make this bread. So does this recipe make 3 of those slices or all of it goes into the mold and makes 1 slice? Yay!! Awesome to hear Safiyya! xo! OMG. This is great as bread, French toast and now as a biscuit. I doubled it. Made in the food processor and it turned out even better. I divided into thirds and it was just the right amount for 3 biscuits. I made egg bacon and cheese biscuits. Wowza. Any idea how to get a biscuit flavor ie not sweet but salty? Baking powder? Help! This is the best bread we’ve had so far. perfect. 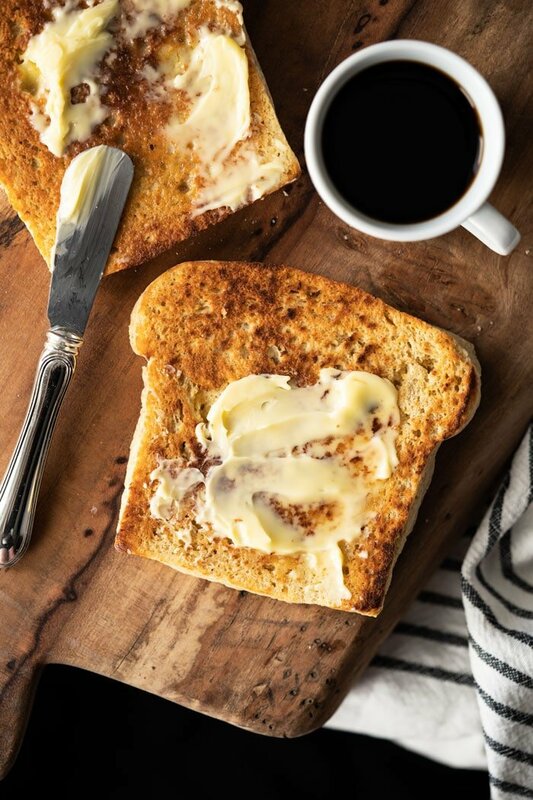 Toasts great, although the butter won’t absorb into the bread and it crumbles a tad when eating it. Overall the taste and texture is amazing. Can I use phylum husk instead of flax? And same amount? Made this tonight, looking forward to toast in the morning! Paola, do you toast it in the oven or in a toaster? Thank you for your delicious recipes! I tripled it and tried it in my 4″ square Pullman loaf pan (tripling everything but the baking powder, I used a little more, 3 tbsp) and it baked up perfectly! Deep golden crust. 350 for 20 min, then covered the top loosely with parchment and baked at 325 for another 25ish minutes (could have probably done 5 min more). Love it! Thank you for this! Love the taste of this bread. However, mine turned out really dry and crumbly. We had the same issue with your tortillas. What are we doing wrong? Hi Carolyn! Def sounds like you’re over cooking! For this one simply cook it less, and for the tortillas you need your skillet to be hotter so they cook quickly (otherwise you’re ending up with tostadas which cook for longer at lower heat) xo! OMG..this 90 second bread is the best! Divided in 3 ramekins, and each piece fits in toaster perfectly. Doesn’t come out crumbly at all. 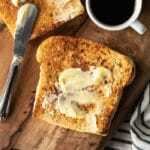 I missed my toast so much before, so am very satisfied now that I have this recipe from you. Can I miss the flaxseed, I have issues with it. Or is there a replacement? I made it and love it! It’s good toasted, and makes terrific grilled cheese (to the person above who asked!) Also, I had to use all almond flour, as my golden flax had gone rancid. Has anyone made a big batch and can tell me what the dry, cup measurements are for one (regular 3 slice) serving is? I cooked mine in a 4 inch square glass dish, and it is perfect! 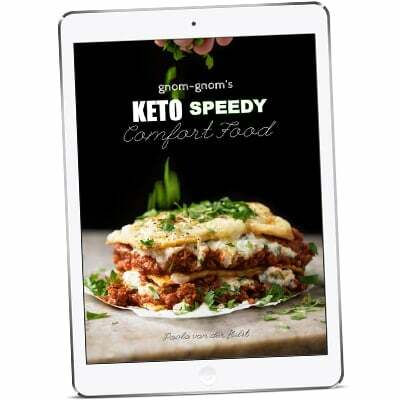 And I really like the measurements in grams…so much more accurate for keto baking. So thank you! What would you recommend as a substitute for the sour cream/heavy cream for a dairy free option? I noticed that the quantity of baking powder changes between metric and US (3/4 tsp. vs. 2 tsp.). Which one is correct for the default 3 servings? Thanks! I haven’t had much luck trying a gazilion recipes for psyllium husk bread as well as the recipes using lots of beaten egg whites. This is SO much better and easier and I don’t have to freeze any leftovers! I just made your bread and it was the best 90 sec bread I’ve ever made. I baked it though at 350 degress for 20 min , double the recipe and in 3 medium ramekins, delicious! I am wondering if lax seed can be substituted since it can be inflammatory for some people, thanks again for a great recipe.